Bussmann BCM Series 3 -Pole Modular fuse block is suitable for using with Class CC fuses. It is rated at 600-Volts. This panel /DIN rail mountable fuse block features thermoplastic body and tin-plated bimetallic aluminum terminals. It measures 3-Inch x 2.4-Inch x 1.3-Inch. This fuse block comes with pressure plate terminal connection. Snap-together design of this block provides toolless assembly of multiple pole blocks at point-of-use to reduce inventory. This compact fuse block with small footprint consumes minimal panel space. It offers easy circuit identification with available universal marker labels. It comes with tin-plated bimetallic copper fuse clips that deliver superior fatigue resistance. 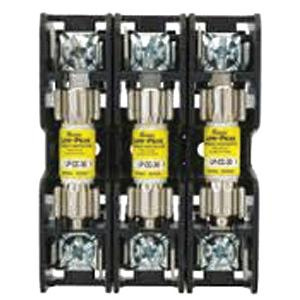 This fuse holder withstands interrupting current rating of 200-Kilo-Amps. It has temperature rating of -40 to 120 deg C. Fuse block is UL listed, CSA certified and RoHS compliant.